Below are resources for making garden maps. Many organizations such as Better Homes and Gardens and the National Gardening Association offer garden mapping tools. 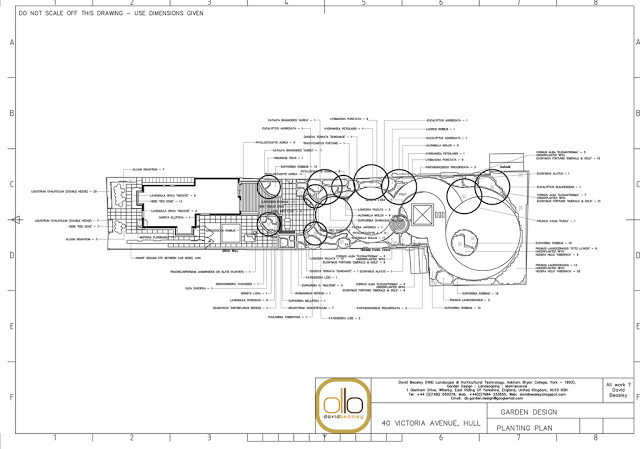 You can also hand draw a map or use a CAD tools or Photoshop to create your garden plan. A quick sketch is a good start for planning out a garden plot and can give you an idea of what kinds of plants fit within your space and the relative sizes of mature plants. My garden is a 4 by 8 foot plot and my rule of thumb was to locate no more than one plant per square foot for most varieties. Smaller plants like herbs could take up to four per square foot, but climbing and vining plants like beans, tomatoes and squash can take two to four square feet of space. This particular drawing was a bit ambitious. Hand Drawn Garden Map of my plot at West 104th Street Community Garden from 2010. 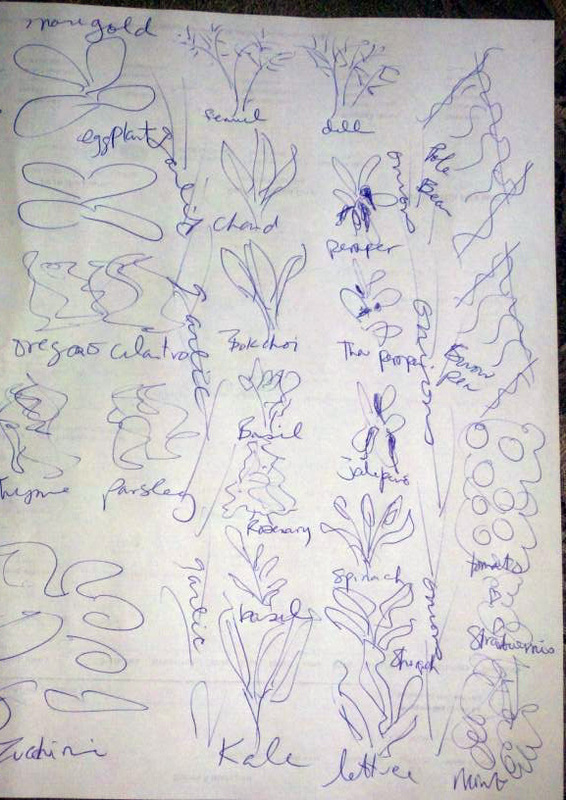 Gemma Nesbitt’s Garden Graphics: How to Plan and Map Your Garden contains 95 pages of symbols to represent various plants and features of a garden. The graphic symbols are meant to replace the more generic symbols used by architects in landscape planning programs because they provide more realistic relative sizing of plants and other features. This book contains simple and easy to follow instructions for using the symbols to plan a garden. Nesbitt also features some remarkable historical maps of gardens such as the ca. 1400 BC garden of a high official of Amenhotep III of Thebes, a 1728 John James garden design. 1728 must have been an interesting year for gardening as Batty Langley’s New Principles of Gardening, was published that same year. Langley promoted a less rigid garden design than what had been popular in French and English gardens at that period, including natural plantings that follow curves instead of straight, structured layouts. George Washington reportedly ordered the book in 1759, shortly after marrying Martha, to inform the design of the gardens at Mount Vernon in 1759, according to the Mount Vernon website. Of course by then the principles were no longer new. More sophisticated drawing and CAD, or Computer Aided Design, tools give you more architectural precision in creating garden plans. These tools, similar to interior design layout software, may contain templates for features such as trees, yard furniture, structures and various types of plants. The following images show garden maps drawn with a simple drawing tool and a more sophisticated CAD program. 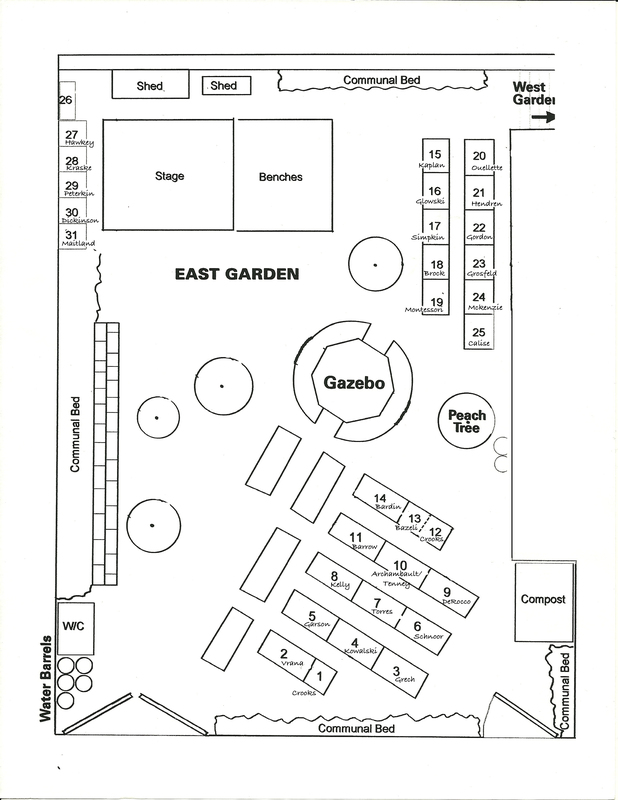 West 104th Street Community Garden, East Garden Plot Map. Example of Landscape CAD Drawing. Credit: David Beasley, from Picasaweb, some rights reserved. 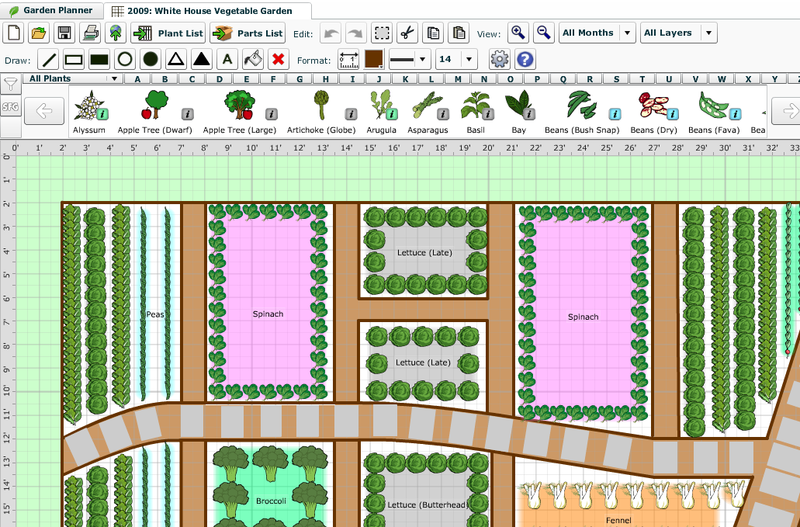 Mother Earth News has a Garden Planner program that allows you to layout a garden plan on a grid. It provides symbols that are similar to the graphics in Nesbitt’s book. It is a subscription based tool available for $25 per year. Better Homes and Gardens used to have a good planning tool but they have replaced it with a rather cumbersome and simplistic paint program dominated by a sketch of a house, so you are forced to design only a front yard garden. Still, their garden plans are quite good. My drawing above is a combination of their Italian Garden and Asian Garden plans. The watercolor drawings are lovely and depict mature plants accurately. A number of other planning tools are available online with varying quality and cost. 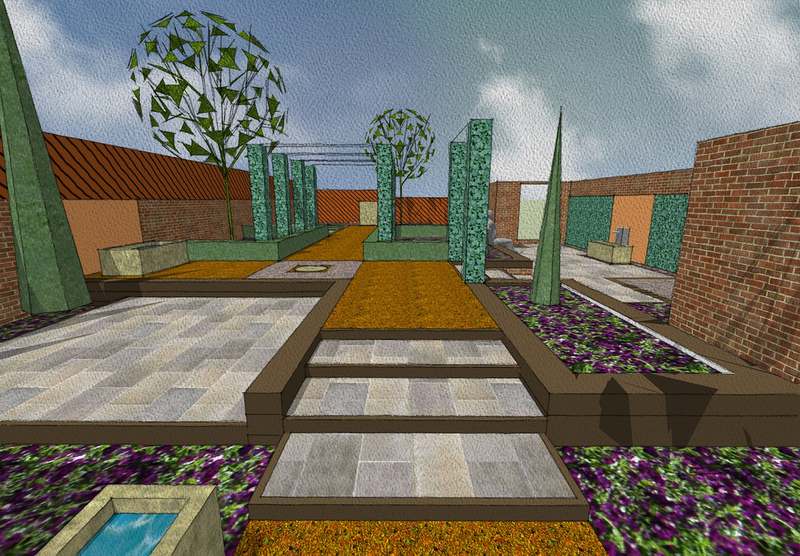 Sketchup, formerly Google Sketchup and recently acquired by Trimble Buildings, is a useful tool for creating 3D garden designs. Garden templates are available including plants, furniture, and skins to mimic various materials like grass, brick walkways and gravel. A professional version is available for $590. A free version, Sketchup Make, is similar to the legacy Google product and provides more limited features. Nesbitt, G. (1993). Garden graphics: How to plan and map your garden. Deer Park, WI : Capability’s Books.